I am often asked what my favorites are in the world of Disney. Favorite rides, Favorite restaurants and so on. Since I am currently getting very excited for my trip to Disney in April I have decided to share a few of my favorite things with you! Favorite Resort: Wilderness Lodge…by a long shot! I have stayed at just about every resort on property and I just cannot find one that I love quite as much as Wilderness Lodge. It is so beautiful inside and out. The quiet pool is one of my favorite places on earth. The rooms are cozy and the grounds are extraordinary. I love everything about this resort. It is a deluxe level resort, but it doesn’t have huge price tag of some of the other resorts in the same category. Favorite Ride: My absolute number one favorite ride is Splash Mountain. 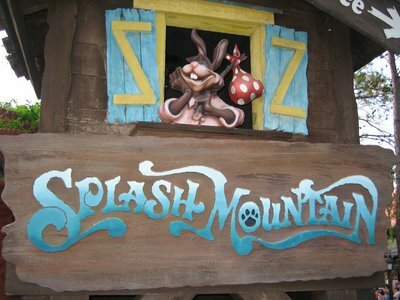 It is a longer ride with great music, spectacular animatronics, a fun story line, and an excellent ending. Big Thunder Mountain is a close second. 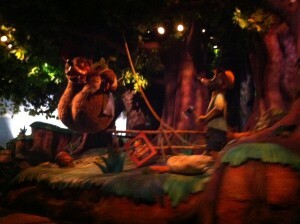 I can spend a lot of time in Frontierland! Favorite Restaurant: I am going with the masses on this and saying ‘Ohana is my favorite place to have dinner at Walt Disney World. I especially love the dumplings and the bread…oh yeah, and the bread pudding for dessert. Yum. 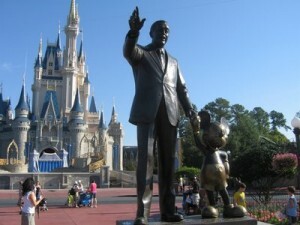 Favorite Park: Magic Kingdom! Without a doubt. Favorite Snack: My absolute favorite WDW snack is the PLAIN mickey mouse rice krispy treats. They used to sell them everywhere, now they are harder to find. I do not care for the chocolate dipped ones. Favorite out of park experience: If I am spending a day outside of the parks, my favorite thing to do is visit Fort Wilderness. I love to see the horses and ponies. On my last trip I got to see them training the ponies who pull Cinderella in the Christmas Parade! I also love to sit on the porch and play Jenga and walk around the trails. It is a great place for a morning off from the parks! So there are a few of my favorite things! What are yours? This entry was posted in My thoughts, Uncategorized. Bookmark the permalink. ← Ready, Set, Book! Spring Holiday Promo!